Earthy Mama: A simple meaning. I love this time of year when the Dandelions pop up. This is a picture of the first one of the season in my yard. What's the big deal you ask? Well Sept. 15th 2005 my big brother passed away at 27 years old. Aaron was always my hero growing up. Even when he was mean to me, like the time he shoved me in the basketball goal and left me, I always looked up to him. He could always find the positive in any situation or person. He knew this was a tough world but he also knew how to push through it. He had a beautiful little girl and a newly pregnant wife when he passed. So needless to say it is always hard for me to deal with his loss. But back to the topic of the flower. My brother would always trick me by saying close your eyes and open your mouth for a surprise, and just as I would get my mouth open he would shove the flower in. LOL. May not seem like the best memory but to me those are all I have. The good and the bad I am thankful for each and everyone of them. I am also thankful for these flowers that pop up and strike those memories for me. sweet story! 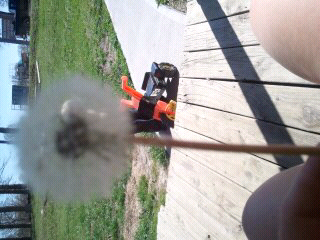 When I get my photography off the ground, a dandelion is going to be in my signature. My kids call them "wish flowers" so I'm going to have "wish flower photography."